problems than begging for money to buy food. I, like many others, "suffer" from being faced with beggars. In my city, Trondheim, you have the Romani-people. In our capital, Oslo, we have people from a lot of nationalities begging for your change. 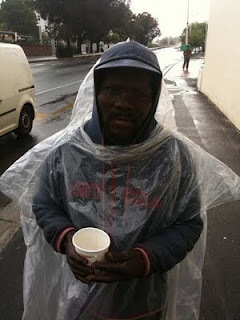 In the City of Cape Town, where I am now situated, you´ll find poor black people, colored people, locals and immigrants, begging for some cents to fight to their hunger. Many of them are kids. I don´t wanna give these people money. 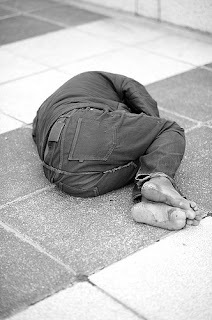 As a fan of systemic change I have always argued that giving beggars your coins is a contribution to status quo because you don't take away these poor people´s incentive to innovate, to make money some other way, and gain the dignity we others subscribe more than anything other to the value of having a job, the value of feeling that one contributes. One can draw parallels to the difference between dumping crates of rice and corn in starvation catastrophe areas, and teaching the people in these areas to harvest their own land. One often says that to give people fish is a good thing, but to teach them how to fish is a better thing. I would go further and teach the people to make fishing yarns and boats to sell to others that fish. to sleep than on the street. On the other hand you have a lot of people arguing that letting people die of starvation is a bad thing, and that is exactly what bothers me. 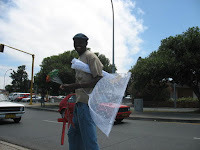 As a "tourist" in Cape Town I have sticked to my policy of not giving beggars, not even hungry children, money if they did not first do something that was of any value to me. My problem in the end, is that I feel bad knowing these hungry children still walks the streets. 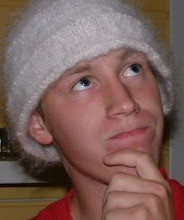 I am having an internal conflict regarding whether or not I should give these kids money from time to time. I have decided not to, and as a relatively rich person I am not yet ready to fully defend it. I give money to people who provide me with a service. The people in Cape Town who shows me where I can park my car, and gives me directions while I am parking. I give money to the people that offers to take the jump from my car when I stop for the red light. I sometimes give money to the people telling me where things are when I am lost, and to the people that sells me The Big Issue. The difference is that I am actually not giving. I am buying a service, and I sometimes pay more, to encourage the activity. From my limited experience as a social entrepreneur I have already experienced that there is a huge difference between the buying of a service and giving money to someone that begs for it. There is a difference, not first of all economically, but in dignity. I have seen drug addicts become more self confident when they were allowed to provide a service for a customer that respected the job they did. The dignity I feel, I don't feel because I have more money than other people, but because I feel that I contribute to something or someone, and I know that's why they are paying me. This goes for carpenters, professors, hair dressers and nurses. We know that we have to wake up in the morning and go to work - or someone will miss our service. In Cape Town I have seen a lot of examples of people taking the step from begging to providing a service in the informal sector. You have people grilling chicken on the street corners in the townships, people making and selling ashtrays made of old cans, people bending metal wire to decor items and selling them on the street. In my own country the streets are sometimes guested by street musicians of varying quality and people entertaining by pretending to be statues or robots. These are all examples of innovation in practice. These people all contribute in different ways. They are trying to create customer value, before asking for money. When they get the money in their hands they know that they have produced something of a certain value. That makes them valuable persons. Persons enjoying more respect than beggars. Today the situation is that many of the big cities in the world are crowded with begging kids who always walk hungry, and sometimes die of starvation, traffic accidents or diseases. That bothers me, but as a sworn proponent of systemic change I refuse to give these poor, starving kids money. I want to start a school. 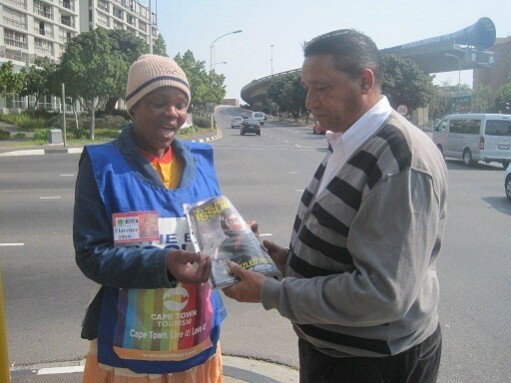 that Big Issue vendors are entrepreneurs. I have, long before my first lecture in innovation, held by Professor Sjur Dagestad in 2007, been interested in business development and customer value, but it was during that lecture I decided that I would some time in the future wanted to work together with Sjur. It was during that lecture I got to know that innovation and the strive to create customer value would be important for me in the next years of my life. In January I stepped up at Sjur's office and asked him what I had to do to work for him. He liked me, and the coming fall I will be working together with him assisting 170 students following the professors lectures on how to create customer value by actually finding out what the customer needs. Everything I learn this fall, and trough my other projects related to innovation, I will use when I am starting CSSI. With the streets and townships as our class room and customers as curriculum, Cape Town Street School of Innovation will gather a bunch of beggar kids from the streets, and teach them everything we know about creating customer value. We will walk around in the city of Cape Town every day, looking for yet to be unleashed value for our future customers. We will try different strategies, and work together on how we can earn money by providing good value to our customers. The focuses will be "What can I do for you?" and "What can be done better here?". Everything will be tried out practically and evaluated. What went wrong? Why is that successful? We will base everything on the ideas provided by the kids themselves, and we will learn by doing. We will invite local entrepreneurs to talk to us about how to start micro businesses, and we will visit small, formal and informal businesses all over Cape Town to learn everything about how the small and big ventures are organized. We will look upon innovation done by street people in all corners of the world, and show the kids movies that may inspire them. I will personally invite Sjur Dagestad and Innoco to come and play with the kids, and working together with SHAWCOs existing educational programs for poor kids we will over time provide them with the knowledge and skills needed to start the businesses they want to start. As long as the kids follow us, they will be given food and shelter, and they will have to follow our rules. We will trust them, but demand something back, and regard ourselves and all the kids a family that should always support each other. Trust, Respect and Optimism will be our core values, and the kids who have the best ideas will be helped to get access to micro capital if they help the younger children by passing by the knowledge they have gained as students of CSSI. Feeling needed and valuable to someone is the only way to become a rich person. CSSI is all about contributing and making value. Cape Town Business School of Innovation (CBSI) will be the structure needed to finance CSSI. It will be run like the educational part of the Norwegian company Innoco (founded by Prof. Dagestad), providing larger businesses with the tools needed to continuously be innovative and get better in creating customer value. CBSI will provide businesses, NGOs and other bodies with seminars, part time educational programs and motivational seminars for their leaders and other employees. All profits from CBSI will be invested back into CSSI. Do note that this is just an idea used in a school assignment, and that neither Innoco nor Prof. Dagestad are at this moment involved in, or informed about this blog post.